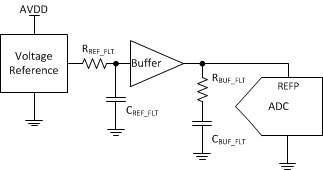 The TLV2556 device is a 12-bit switched-capacitor successive-approximation analog-to-digital converter (ADC). The ADC has three control inputs: chip select (CS), the input-output clock, and the address and control input (DATAIN). These inputs communicate with the serial port of a host processor or peripheral through a serial 3-state output. In addition to the high-speed converter and versatile control capability, the device has an on-chip 14-channel multiplexer that can select any one of 11 inputs or any one of three internal self-test voltages using configuration register 1. The sample-and-hold function is automatic. At the end of conversion, when programmed as EOC, the pin 19 output goes high to indicate that conversion is complete. If pin 19 is programmed as INT, the signal goes low when the conversion is complete. The converter incorporated in the device features differential, high-impedance reference inputs that facilitate ratiometric conversion, scaling, and isolation of analog circuitry from logic and supply noise. A switched-capacitor design allows low error conversion over the full operating temperature range. An internal reference is available and its voltage level is programmable through configuration register 2 (CFGR2). The TLV2556 is characterized for operation from TA = 40°C to +85°C.